HIGH POTENCY AND NO FISH BURPSGet 2600mg Of Omega 3 Fish Oil with NO FISHY AFTER TASTE! OMEGA 3 FISH OIL SOURCED ONLY FROM USA TOP QUALITY DEEP COLDWATER OCEAN LIVING FISH – We use only the best top quality fish from the USA in deep coldwater areas guaranteed to have the highest purity, nutritional value, and safety for you. When it comes to fish oil omega 3, quality is determined by where the fish actually come from! 100% PURE MOLECULARLY DISTILLED & HIGHEST ABSORPTION OMEGA 3 FISH OIL – By molecularly distilling our omega 3 fish oil we are able to safely remove heavy metals, PCB’s (chlorine compound found in water), and many other potential harmful toxins. If your current or past fish oil is not molecularly distilled, you really have no idea what may be in your supplement! NEW HIGHEST DOSE AND MAXIMUM POTENCY BOOST YOUR FISH OIL BENEFITS & Comes in a 3 MONTH SUPPLY – Providing an UNMATCHED 2,600mg per serving of total Omega-3 fatty acids comprising of 650mg DHA, 860mg EPA, and 130mg other fatty acids. No Other Brands Have this Maximum Dose & Highest Potency Combination Available! THEIR FISH OIL OMEGA 3 HAS NO FISHY AFTERTASTE OR FISH BURPS – THEY ADDRESSED THIS IN 2 WAYS – 1) They Added LEMON OIL & 2) They Added Thicker Gelatin Shell! The Thicker Gel Cap is designed to hold together Longer in acidic conditions (the stomach) and break down in non-acid conditions and therefore release the omega 3 fish oil in the intestines and not the stomach. As a Secondary Measure they added lemon oil to their omega 3 fish oil to eliminate the fishy taste. So if you can’t stand the fishy aftertaste or the dreaded fish burps, Look No Further! 100% SATISFACTION GUARANTY – This Is The Highest Quality Omega 3 Fish Oil Ever Available With The Highest Safe Dose And Maximum Potency Available – They Confidently Back It Up With Their World Class Customer Service & Now Famous 100% Satisfaction Guarantee! 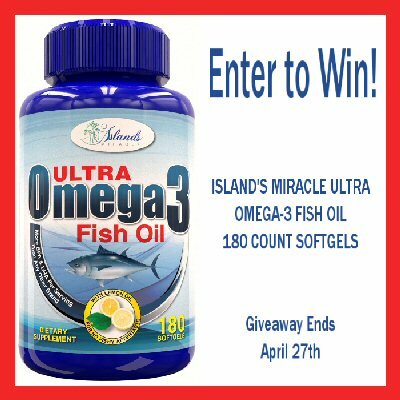 My Thoughts:With all the benefits that Omega 3 fish oil provides to your heart, mind, joints, skin, and mood taking a quality product like this one from Island’s Miracle is important to make sure that you are getting the most benefit possible. I like that they’ve added lemon oil to prevent the aftertaste that I get from some other brands. Disclaimer: Tales From A Southern Mom is not responsible for the awarding of the prize. Sponsor is responsible for prize fulfillment. Disclosure of Material Connection: PaulaMS’ blog received the above product for free to facilitate the writing of this review. Some of the links on this post are affiliate links. This means if you click on the link and purchase the item, I may receive an affiliate commission. Regardless, I only recommend products or services I use personally and believe will add value to my readers. I am disclosing this in accordance with the Federal Trade Commission’s 16 CFR, Part 255: Guides Concerning the Use of Endorsements and Testimonials in Advertising. My joints need some fish oil. My doctor just told me my cholesterol is high and fish oil would help me bring it down. I know I need to take fish oil. I like that it’s US sourced. I think that fish oil is a product that many people can use for better health. The highest absorption fish oil is very good. Actually this claim is wonderful. I would love to try it. I think that fish oil is something beneficial for someone to use. I think that this is a product that would be very beneficial to take daily. This product sounds like really good quality fish oil pills. I love that they added lemon oil so your not burping up that yucky fish taste. I am happy this product is made in the U.S.A., with no fishy aftertaste and maximum potency.